Cut the loins in half so each was about four pounds in green weight and injected each piece with six ounces of the brine solution, then covered the loins with the remaining brine and gave them a five day fridge nap. Tossed them into the Pro 100 to dry for a couple of hours at 100º, then put in a pan of damp applewood and raised the temp to 110ºfor the next eight hours. Changed the chip pan and raised the temp to 135º for the next five hours, then removed the pan, closed the vents, and raised the smoker temp to 175º. 21 hours total in the Pro 100 got me to a internal temperature of 150º, the load got pulled. Ray, I know, it's really annoying. If you can, use a photo editor to optimise (optimize) the pics to 600 - 700 pixels wide. What's Mapleine? And, I'd love to know more about the Pro 100. Thanks Wheels, I think I can figure out how to get the pics shrunk down to the proper size now! Mapleine is a maple syrup concentrate, a two ounce bottle makes 27 pints of maple flavored syrup. I use it in ham and CB brines and when I make batches of my maple-apple breakfast sausage, kids just seem to love the stuff. The Pro 100 is a commercial grade smoker-roaster made by PS Seasonings out of Iron Gate Wisconsin. It was made for Cabelas, where I bought mine a few years back, and sold as the Cabelas Pro 100 SS commercial grade smoker. I love the thing! 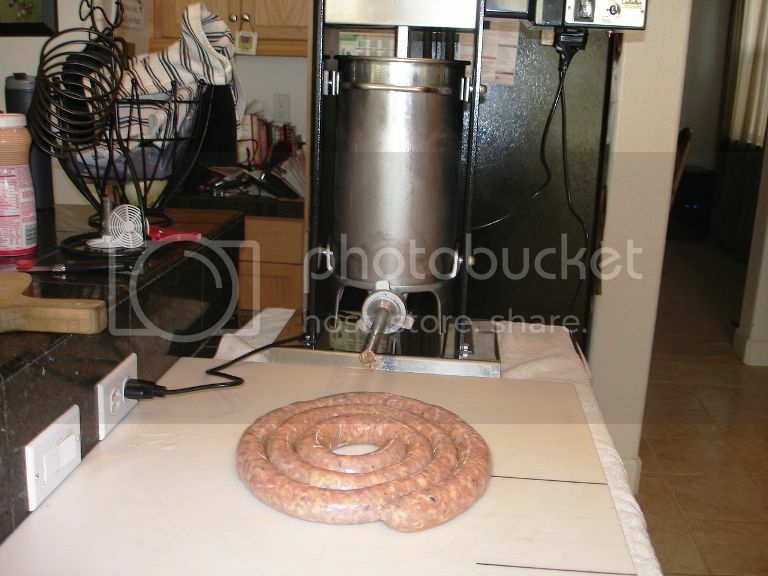 I'm a sausage stuffer and this unit has never let me down. It also does a fantastic job with the wild hog hams I smoke along with the smoked chickens and turkeys I produce. I can flip a switch and it goes from 625 watts to 1250 watts and is a perfect roaster for six hour pork ribs, pulled pork roasts, and does a unbelievable job on prime rib. Mine came in a black exterior from Cabelas which I believe is no longer available, I got it on sale for $1199 and free shipping at the time. Here's the link, I also use their 260-B Italian sausage seasoning mix, it's a family favorite and I haven't been able to come close to the great flavor by mixing my own spices, and I've tried many times. Fact is today I smoked a half dozen turkey legs for my wife in the Pro 100, the pic didn't turn out , too dark. I made a brine that I use for whole chickens and turkey that my guru from a former site that I frequented gave to me. Geeze the bird with 10% of their green weight and cover with the rest of the solution overnight.Preheat smoker to 110 degrees F; open damper 3/4. Hang product in stockinettes (no parts touching).Insert temperature probe into ball socket joint, but not touching bone.Run at this temperature for 1 hour.Increase thermostat to 125 degrees F; place 1/3 pan sawdust (moistened) on burner.After 4 hours place another 1/3 pan of moistened sawdust on burner. Increase temperature to 140 degrees F. Close dampers.After 4 hours remove sawdust pan; increase temperature to 185 degrees F.Heat at this temperature until internal temperature reaches 165 degrees F.Turn OFF thermostat and let cool to 100 degrees F.
By George I've got it!!! Those look so much better than the one I made recently! I will start picking your brain once I got around doing another one. Many thanks sawhorseray. That looks a serious bit of kit.